Deep in the heart of the Amazon, legends tell of a river so hot that it boils from below. As a geoscientist, Andrés Ruzo’s training told him the stories couldn’t be true. But that was before he saw the river with his own eyes. It’s incredible to think there are natural wonders on this planet not yet known to science, but such was the case for the river at Mayantuyacu, publicized for the first time in The Boiling River: Adventure and Discovery in the Amazon. The book is an engrossing, true story of discovery, adventure, science, and mysticism, told by a man who was driven to explain something impossible, and is now on a quest to preserve it. When he was twelve years old growing up in Peru, Ruzo’s grandfather told him a strange story. After Spanish conquistadors killed the last Inca emperor, they headed deep into the Amazon rainforest in search of gold. Few of these men would ever return, but those who did spoke of a waking nightmare—poisoned water, man-eating snakes, starvation, disease, and a river that boils from below, as if lit by a great fire. The image of that boiling river seared itself into Ruzo’s mind. But it wasn’t until years later, as a PhD student in geophysics at Southern Methodist University, that he started to wonder if the legend could be true. This wasn’t just idle curiosity: Ruzo’s thesis project was initially focused on creating the first detailed geothermal map of Peru, including parts of the Amazon. If a boiling river existed, it would surely merit recognition. But his senior colleagues dismissed the idea as preposterous. It would take a tremendous amount of geothermal heat to boil even a small section of a river—and the Amazon basin lies hundreds of miles from any active volcanoes. One advisor even suggested that Ruzo stop asking “stupid questions” if he wanted to finish his PhD. But Ruzo didn’t stop asking. And eventually, he found someone who took his questions about a boiling river seriously: his aunt. That’s because she’d been to one. The river turned out to be no legend at all, but the sacred geothermal healing site of Mayantuyacu, nestled deep in the Peruvian rainforest and protected by a powerful shaman. Ruzo couldn’t quite believe it until he saw it for himself, but once he did, his life changed. Up to 82 feet (25 meters) wide and 20 feet (six meters) deep, the river surges for nearly 4 miles at temperatures hot enough to brew tea or cook any animals unfortunate enough to fall in. And yes, a small portion of it is so hot that it actually boils. There are documented hot springs in the Amazon, but nothing nearly as large as this river. Mayantuyacu is visited each year by a handful of tourists, who come to experience the traditional medicinal practices of the Asháninka people. Save several obscure references in petroleum journals from the 1930s, scientific documentation of the river is non-existent. Somehow, this natural wonder has managed to elude widespread notice for over seventy five years. Many of us turn to fiction to escape the mundanity of the real world. But as The Boiling River so poignantly illustrates, fantastical discoveries are lurking all around us. It takes a special type of persistence, and a little bit of crazy, to pull the clues out of the white noise of everyday routine. When Ruzo did, he was rewarded with the biggest adventure of his life. And it’s an adventure that’s just beginning. Having forged a strong relationship with the local community, Ruzo is now conducting detailed geothermal studies of the boiling river, attempting to place it in the context of the Amazon basin. He’s also collaborating with microbial ecologists to investigate the extremophile organisms living in its scalding waters. Anything that survives here could offer insights into how life got its start billions of years ago, when the Earth was a much harsher planet. 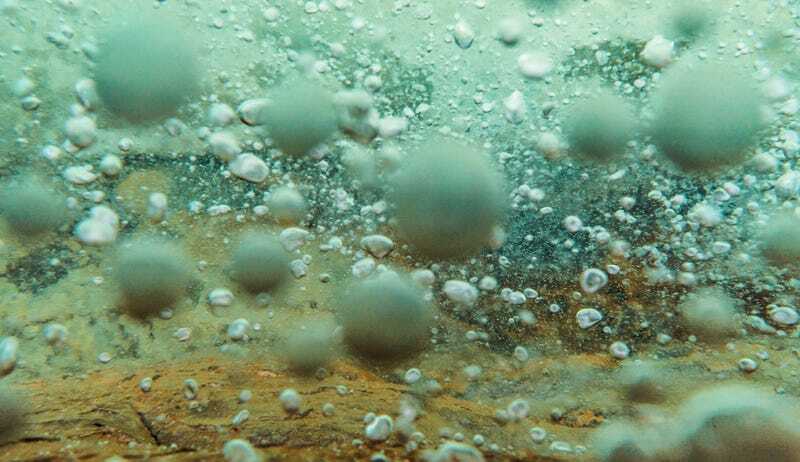 Ruzo hopes that by putting a spotlight on the boiling river, he can garner the public interest and financial support needed to ensure its long-term survival. While Mayantuyacu faces many threats, from loggers to would-be energy developers, the coalition to protect its unique natural and cultural heritage grows stronger every day. Ruzo recently received a grant from National Geographic, part of which will go toward using technology—drones, satellites, and the like—to learn which regions of the surrounding forest are the most vulnerable. To strengthen the conservation effort on the ground, he’s teamed up with Peruvian environmental organizations, and local community leaders. Ultimately, if the boiling river is to survive, it’ll be because people came together and recognized its intrinsic value. After reading Ruzo’s captivating, real-life adventure story, you might be inclined to agree.